Autumn is not only a beautiful time of year, but it’s a perfect time for lawn and garden maintenance. I am not a fan of lawns, as they require too much time, energy, money and maintenance to keep green and are actually detrimental to the environment (Read my earlier post here). However, most people do have lawns, and learning how to care for them is essential to the well-being of the environment, as well as your children and pets. KEEP MOWING: Your lawn continues to grow into autumn so keep mowing it. While I advocate using a reel mower for small lawns, sometimes a motorized lawn mower is needed, like if your lawn has a lot of weeds. Be sure to bag the clippings in fall so you don’t spread weed seeds. (In spring and summer, leave the clippings on the lawn which add nitrogen needed for good grass growth). AERATE: Any land that has been developed for housing or other purposes is going to be compacted, and compaction leads to stormwater runoff, which pollutes our waterways. Aerating your lawn allows air, nutrients and water to get down to the roots of the grass, which keeps it healthy. The key is to aerate in the fall for 2 or 3 years, then microbes and earthworms in your soil will aerate it for you from then on! FEED YOUR LAWN: After aerating, add natural fertilizer or top dress the lawn with compost, then overseed with grass seed. Before fertilizing, you need to test the soil to see what it’s lacking, if anything. This can be done through Cooperative Extension Services for a small fee. LEAVE THE LEAVES! Blowing leaves out of the yard is a big mistake. As they break down on the grass, fallen leaves add nutrients and organic matter vital to a naturally healthy lawn. Leaving the leaves in a more woodland setting is very important, because the decomposed leaves add to the spongy organic soil layer that absorbs and holds rainwater, preventing stormwater runoff problems. Small leaves like those from honey locust, crab apple, cherry, willow and some ash trees don’t even need to be chopped up to break down quickly. Larger leaves like maple, oak and sycamore leaves need to be shredded by a mulching mower. Be sure to only use non-diseased leaves. 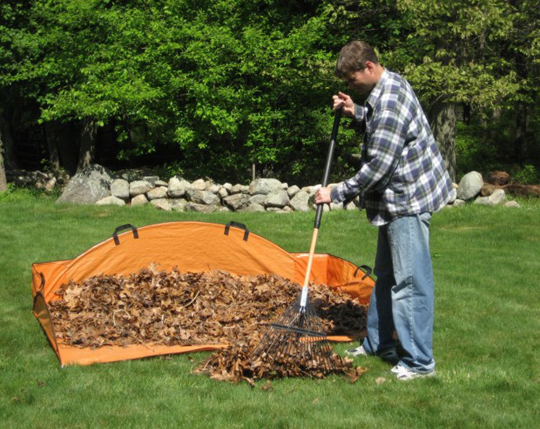 If the layer of leaves has built up too thick to get the mower through, rake the leaves onto a tarp and pull it over to your compost pile (or take this opportunity to start one. They’re easy!). Or work fallen leaves into vegetable and annual beds for added nutrients. PLANT SPRING-BLOOMING BULBS: If you want your yard to look different from a typical strip mall parking lot, avoid planting daffodils and other non-native species. There are so many wonderful native bulbs to give your yard a more custom appearance. LEAVE GARDEN BEDS ALONE: Unless you’re trying to prevent a particular plant from spreading (like invasive plants or even some aggressive natives), leave seed heads and dried plants still standing until early spring. This will provide vital food and shelter for birds when they need it the most. PLANT TREES AND SHRUBS: Fall is a great time for planting! Native plants are the best choices as they provide food and shelter for songbirds and other wildlife. Placing your trees and shrubs in the right place will actually save you money on heating and cooling bills. Learn how. TREE PRUNING: It’s the perfect time to remove dead branches, as well as crossing or rubbing branches and suckers, which rob healthy limbs of nutrients. MULCH AROUND TREES: It’s important to have at least a 6 foot ring of mulch around trees. A 2-3″ layer (no more than that!) protects the trees from lawn equipment, keeps your plants warmer in the winter (and cooler in the summer), retains moisture for tree roots and inhibits weeds. Fallen leaves naturally provide a layer of mulch in wooded areas. Shredded leaves work best as mulch around trees, but if you’re using unshredded leaves around trees planted throughout your yard, just be sure the layer of leaves doesn’t become matted. This would prevent water from infiltrating into the soil. Also, it’s important to keep mulch about 3″ away from the tree trunk.